PERTH. BEST OF THE WEST : Although Perth is the one of the most remote cities on earth, it resonates with confidence and prosperity. Much of this prosperity is the product of Western Australia's extensive mineral wealth. Perth's Swan River was named by the first European settlers (in 1829) after its resident Black Swans. Just south of the Perth is the port of Fremantle whose convict-era buildings - such as the Fremantle Prison - contrast with Perth's modernity. 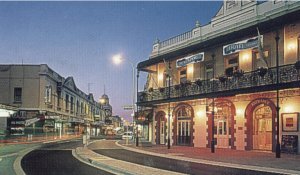 Fremantle's waters are famous for yachting, most memorably the America's Cup challenge in the 1980s. 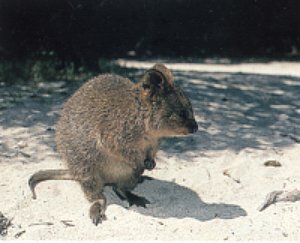 Offshore, Rottnest Island gained its name from early Dutch navigator who thought the 'quokkas' (a small relative of the kangaroo) they saw were rats-the name means 'rat's nest'. Even the pub on this sandy isle-Perth's play-ground-is know as 'the Quokka Arms'. NATURAL WONDERS : Western Australia's national parks ensure the survival of its most fragile natural features. 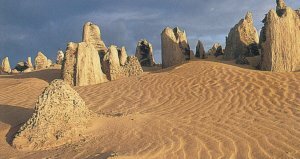 North of Perth are the enigmatic Pinnacles in Nambung National Park, protruding sandstone spires formed around the roots of ancient plants. Further north, at Kalbarri are the gorges of the Murchison River and towering, multi-hued sea cliffs overlooking the Indian Ocean. In the Pilbara region in the north-west of the state are the lush Millstream-Chichester National Park and the nearby Fortescue River. At Monkey Mia, in Shark Bay, a group of dolphins regularly swims into the shallows. They aren't tame, just sociable so you can feed them or swim with them, or both. Broome, on the far northern coast, was once know as the Port of Pearls because of its pearling industry; luggers still tie up at its old jetty but today pearling has been replaced by tourism. The 22 kilometre-long Cable Beach is the town's principal attraction. Among the west coast's more unusual animals is the tiny, kangaroo-like quokka. The Argyle Diamond Mine, near Kununurra, is the largest in the world, annually producing about five tonnes of mostly industrial stones but also the world's only large pink diamonds. There are air tours to the mine from Kununurra. Geikie Gorge National Park, in the far north near Fitzroy Crossing, is spectacular, with not only freshwater crocodiles in abundance, but also stingrays and swordfish adapted to fresh water. Perhaps the giant Kimberley region's most stunning sight is the maze of beehive-shaped, striped sandstone domes, known as the Bungle Bungles, in the Purnululu National Park.